It is safe to say that the Japanese camera inrush around 1960 could not have been better timed. The western world, including the new world, was with few exceptions, stuck in old conventions and, for a wide variety of reasons, unable to exploit the opportunities at hand, despite the fact that there had already been developed several promising SLR concepts. The Japanese engineers saw the opportunities, and made the most of it. At first Nippon Kogaku chose to build rangefinder cameras, but soon they realised that the SLR camera would be the future professional camera of choice, and launched their impressive Nikon F system camera. It was not the first 35mm SLR from Japan, it was not even necessarily the best camera, but Nippon Kogaku was the most determined one to make their camera a success, and they had already established themselves as a leading optical manufacturer. Several other Japanese camera and lens makers were equally successful in their market segments. In conclusion, it was a complete takeover. 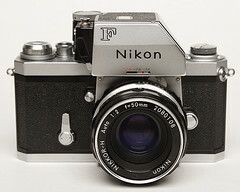 The Nikon F was introduced in 1959 with a comprehensive range of high quality lenses and accessories. During its lifespan, new items were continuously added, comprising bulk film magazine, electrical motor drive, viewfinders, focusing screens, close-up and scientific attachments, flash units, remote controls, and even a Polaroid back, the Speed Magny, as well as a wide variety of exposure meters, both separately available or as part of the finder prism, the latest of those being TTL meters, known as the Photomic. It would be impossible to plan for every conceivable future attachment to go on the Nikon F, and although the designers have eminently well succeeded, quite a few less practical arrangements have been employed. 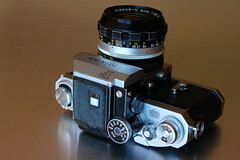 Nippon Kogaku used their Nikon rangefinder camera as a starting point, adding a mirror housing and an interchangeable viewfinder, when developing the Nikon F body. The finder attachment resembles that employed for the Exakta Varex, using a number of catches. As it turned out, the system was not the best choice, and it has been the cause for several afterthoughts. The most important attachment, however, is the lens. Nippon Kogaku developed a bayonet mount still found on their digital cameras. It is made of stainless steel and just sufficiently wide to accept all internal connections that have been added ever since its inception. The big challenge for every camera maker around 1960 was how to incorporate an exposure meter in their camera, and each came up with their own solution, some great, others less practical. None envisioned all the necessary interconnections, and a wide range of solutions were found. Connecting the meter to the shutter speed dial was obvious, but including the aperture ring was not so clear, most relied on manually transferring the meter reading to the lens aperture ring. 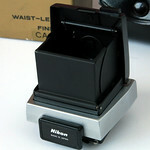 The Nikon Selenium meter connects to the shutter speed dial, and the reading must be transferred manually. It is attached to the nameplate in front of the finder, surely looked upon as a temporary solution. In 1962, the Photomic CdS meter finder was introduced, with a circular external meter window. The meters were connected to the lens using an external fork on the aperture ring and a pin reaching down into it from the meter above. This system prevailed for decades and was sturdy, but rather clumsy and far from perfect. On the ensuing range of TTL finders, beginning in 1965, various improvements were introduced. The main problem was to calibrate the meter for the maximum aperture of the attached lens. This was at first accomplished manually, later on the Photomic Ftn, by twitching the aperture ring through its full range. 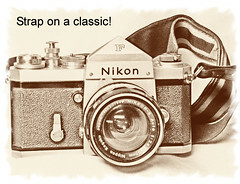 The Nikon F is extremely sturdy and reliable, and quite easily handled. 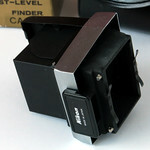 The camera back, however, is not hinged and has to be set aside when changing film. Because the finder is detachable, the accessory shoe is at the side, requiring special attachments. A small window in front of the shutter speed dial shows the flash synchronisation setting, selectable by lifting the chrome collar surrounding the dial. In the middle of the shutter-speed dial is a small black dot a shutter wind indicator: at nine o'clock it is wound, and at seven o'clock it is run out. A film length reminder and an automatic reset frame-counter shares the space at the hub of the wind lever. To remove the finder a stiff button at the camera back is depressed, possibly using a blunt object. To remove the focusing screen it has to be depressed again while the camera is held upside down to let it fall out on a soft lint free cloth. Replacing the plain prism finder or a waist level finder requires just depressing it onto the camera until the three latches catch. 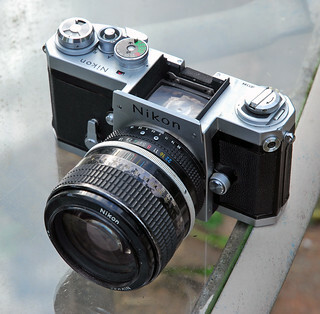 The Photomic finders rely on an additional mechanism grabbing around the Nikon nameplate. An additional handle at the right-hand front of these finders must be pushed simultaneously with the stiff one at the camera back. Removing and attaching the Photomic requires some practice to accomplish. Always double check that all the latches have engaged properly. When the finder is in place and a lens is attached, the meter must be set for the lens maximum aperture, aided by a scale on the meter prism front. At the upper left-hand corner of the camera is the PC sync. contact, and lower down, close to the lens, is the lens release button. At the opposite side of the lens are a depth of field preview button and a mirror up knob. The mirror goes up when the shutter is released, and it stays up until the knob is returned to the index point. A small self-timer handle, with 4, 8, and 12 seconds index marks, is also at the right-hand front, doubling as a grip as on most SLR cameras. The standard lens for the early Nikon F is the Nikkor-S Auto 1:2 f=5cm, half a year later the Nikkor-S Auto 1:1.4 f=5.8cm became available. 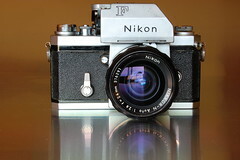 The Nikon F was succeeded in 1971 by the Nikon F2. It is a completely new camera with practically the exact same functions and solutions. New features of notice are a very early use of the 3 volt silver oxide battery for the meter circuits in the finder, and a wind-on lever operated battery power switch, - a red dot is visible when on; and the shutter is extended to 1/2000 second. 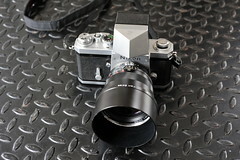 The Photomic concept with the external link to the lens aperture ring is carried on unchanged. The Nikon designers has, however, sorted out the mirror-up function, and the self timer is calibrated in two seconds intervals from 2 to 10. The latter doubles as time exposure when set within the same range, and: the shutter-speed dial is set to B, the shutter-release collar is turned to T, and the ordinary shutter-release is depressed. A very useful Motor Drive MD-1 for the F2 was also introduced. Reynolds, Clyde. Nikon F Book. Focal Press, 1977. 140 pages. ISBN 0240509056. This page was last edited on 15 January 2018, at 06:15.